Africa may have given rise to the first humans, and Egypt probably gave rise to the first great civilizations, which continue to fascinate modern societies across the globe nearly 5,000 years later. From the Library and Lighthouse of Alexandria to the Great Pyramid at Giza, the Ancient Egyptians produced several wonders of the world, revolutionized architecture and construction, created some of the world’s first systems of mathematics and medicine, and established language and art that spread across the known world. With world-famous leaders like King Tut and Cleopatra, it’s no wonder that today’s world has so many Egyptologists. The 5th century BCE Greek historian Herodotus wrote that Egypt was “the gift of the Nile” because the river made its soil so fertile and thus helped create one of the first great civilizations. Indeed, the land of Egypt so impressed the Greeks that when Alexander the Great conquered the Nile Valley in the 4th century BCE, he decided that he would build a new city on its soil and name it Alexandria. After Alexander, the city of Alexandria grew and became the most important city in the world for centuries as it watched and played a role in the rise and fall of numerous dynasties. The city also became home to one of the Seven Wonders of the Ancient World – the Lighthouse of Alexandria – and a center of culture and learning, which was exemplified by the Library of Alexandria. Truly, Alexandria was as unique as it was great; it was a Greek city built on Egyptian soil that was later ruled by the Romans and then became an important center of early Christian culture. Today, Alexandria is a teeming metropolis that, although much larger than it was in ancient times, is a shadow of its former self culturally speaking. So what made Alexandria stand apart from other ancient cities such as Rome and Babylon and how did it become the gift of the Mediterranean? The answer is complicated, but an examination of Alexandria’s history reveals that from the time the city was founded until the Arab conquest, the different dynasties who ruled there took the time and effort to foster and patronize arts, culture, and learning that made Alexandria famous. Alexandria was also an important center of trade in the ancient Mediterranean world as tons of grain, gold, and papyri sailed down the Nile River on barges to the harbors in Alexandria and then to the rest of the world, while exotic spices, silks, and other commodities were imported into Egypt via the same harbors in the ancient city. Some of the features of Alexandria changed throughout the centuries, but its most vital components remained consistent. Alexandria meant different things to different people, but for over 500 years all people saw the city as a center of culture. 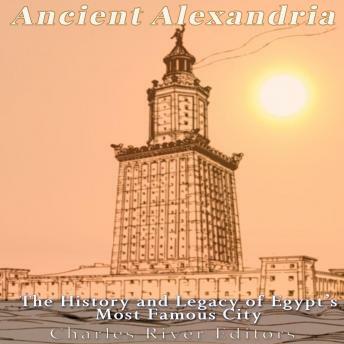 Ancient Alexandria: The History and Legacy of Egypt’s Most Famous City examines the history of one of the ancient world’s most important cities.